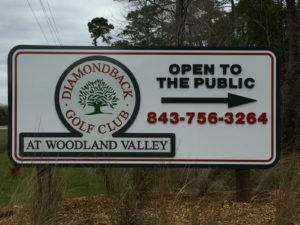 Many of you who visit us on a regular basis may notice something NEW next time you visit and for those visiting for the first time…Diamondback Golf Club at Woodland Valley has their NEW Sign directing you to our Club. Great golf course conditions, best Southern Hospitality on the Strand and lets not forget about our affordable golf rates and great membership opportunities. Located just a few miles outside the immediate Myrtle Beach Area Grand Strand, Diamondback Golf Club at Woodland Valley is a MUST play over and over. Contact us today at 843-756-3264 or email us at gm@playdiamondbackgolf.com.